In "Free to Die," columnist Paul Krugman claims that the GOP debate crowd "erupted with cheers and shouts of 'Yeah!'" in response to Wolf Blitzer questioning Ron Paul if society should let a hypothetical man die for lack of health insurance. Eric Wemple at the Washington Post actually watched the video and disagreed: "A few jeers? Yes. Heckles? No question. 'Audience' cheers? No way. The voices that can be heard in the video - perhaps two or three of them - don't constitute an 'audience' reaction. There were 1,100 people in the crowd." 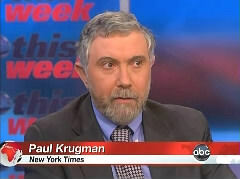 New York Times columnist Paul Krugman just can't stop offending of late. Krugman confounded even liberals with his ill-timed blog post on the morning of September 11 decrying President George W. Bush and New York City Mayor Rudy Giuliani as 'fake heroes' in the aftermath of the World Trade Center attacks. In his Friday column 'Free To Die,' he suggested Republicans would prefer people die for lack of health insurance, using as evidence the dubious claim that the audience watching CNN's Republican debate 'erupted with cheers' at the prospect of a (hypothetical) man dying for being unable to afford intensive care. Has Krugman actually watched the clip? Back in 1980, just as America was making its political turn to the right, Milton Friedman lent his voice to the change with the famous TV series 'Free to Choose.' In episode after episode, the genial economist identified laissez-faire economics with personal choice and empowerment, an upbeat vision that would be echoed and amplified by Ronald Reagan. But did it really? Erik Wemple, who blogs for the Washington Post, fact-checked the horrified liberal response of commentators like Krugman. This is how Wemple described what happened after debate host Wolf Blitzer raised his inflammatory question (you can watch the clip at the Post). A few jeers? Yes. Heckles? No question. 'Audience' cheers? No way. The voices that can be heard in the video - perhaps two or three of them - don't constitute an 'audience' reaction. There were 1,100 people in the crowd. The episode is the clumsy work of a few loons or meatheads in the audience. Think, in particular, of the children. The day after the debate, the Census Bureau released its latest estimates on income, poverty and health insurance. The overall picture was terrible: the weak economy continues to wreak havoc on American lives. One relatively bright spot, however, was health care for children: the percentage of children without health coverage was lower in 2010 than before the recession, largely thanks to the 2009 expansion of the State Children's Health Insurance Program, or S-chip.